After enduring a scandalous divorce in England, Larita Filton (Isabel Jeans, Suspicion) moves to France where she plans to rebuild her life. While on a French Riviera vacation, Larita meets a wealthy British man (Robin Irvine, Downhill) and marries him on a whim. The newlyweds return to England to meet the husband’s family and Larita soon discovers that her in-laws disapprove of the marriage. Easy Virtue probably should have never been made during the silent era. It’s based on a Noel Coward play known primarily for its sophisticated dialogue, something nearly impossible to integrate into a silent movie. Eliot Stannard, who wrote the scenario, tried to retain some of Coward’s best lines, but it was a fool’s errand. Director Alfred Hitchcock’s notoriously anti-dialogue attitude further neuters the play by using as little title cards as possible. We are left with the skeleton of Coward’s story, which is nothing but high-pitched melodrama. These are very bad news. The good news is that Hitchcock is forced to be creative and inventive, which in plain English means that the film is, at the very least, great to look at. You can clearly see Hitchcock trying to add a little something to each and every scene. The result is more Hitch than Coward and that is a good thing — the director is able to give the whole thing a fine cinematic quality. Right off the bat, Hitchcock creates a few visually striking moments that will linger in your head for days. 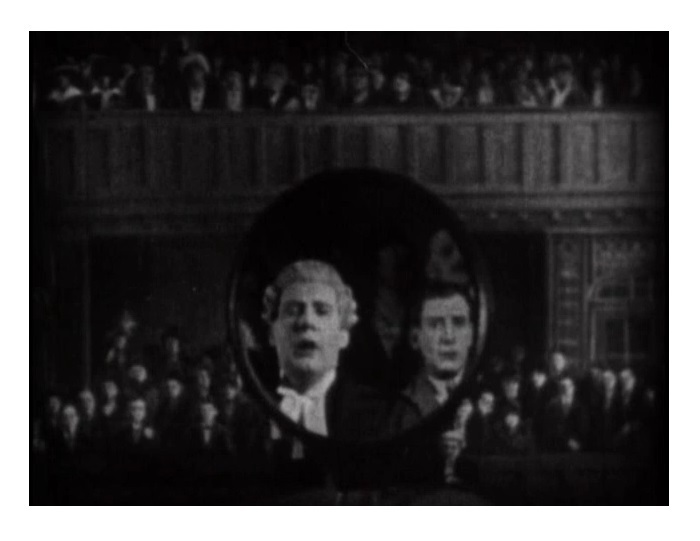 The film opens with a shot done through a giant-sized monocle. The director’s genius is more noticeable during the marriage proposal scene, the film’s most ingenious moment. We see the entire sequence from the point of view of the telephone operator who is listening to the two lovers’ conversation. That’s a clever touch that emphasizes the director’s predilection for the humorous, unusual and visual. Easy Virtue‘s baroque sets are also a nice touch. 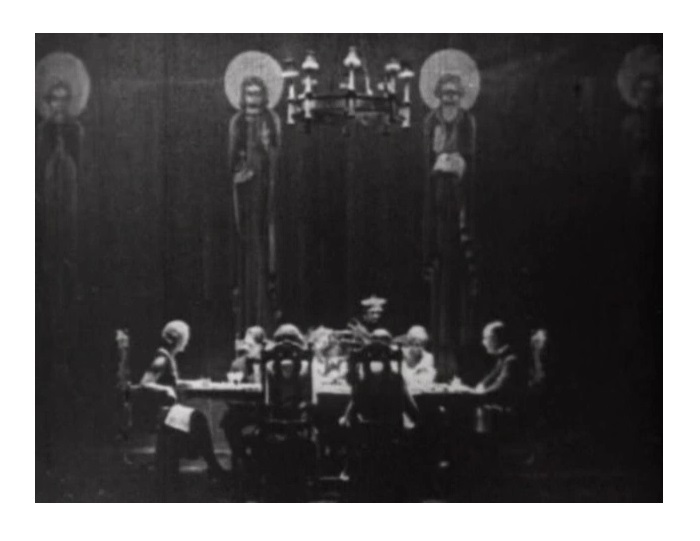 The family’s mansion looks more like a Cathedral than a home, which serves to push the idea that the members of the family are pious and judgmental. You can immediately understand why the heroine feels intimidated by her in-laws. It’s an economical way to convey an idea that would have required lots of dialogue. 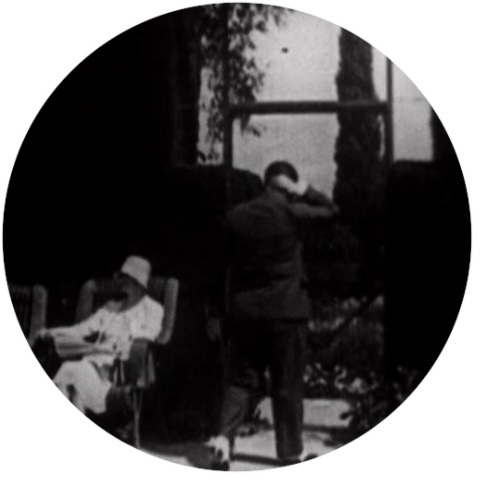 Most interesting is Hitchcock’s constant preoccupation with the voyeuristic nature of photography. Larita is never left alone by the paparazzi, always prying into her personal life. The viewer is manipulated into condemning the intrusiveness of the press yet movie-watching is a form of voyeurism — the director cleverly plays with the obvious hypocrisy. 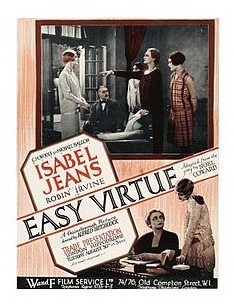 Easy Virtue is nothing to brag about, Hitchcock insisted — he never had much to say about the movie. It was the last movie Hitchcock made for Gainsborough Pictures, the company that gave him his first big break, and he always saw the movie as something he had to do in order to fulfill his legal obligations. But like any other Hitchcock movie, Easy Virtue has plenty of goodies that will delight die-hard fans. Remade in 2008, with Jessica Biel as Larita. B&W, 80 minutes, Not Rated.